"All are welcome, all will feel welcome." 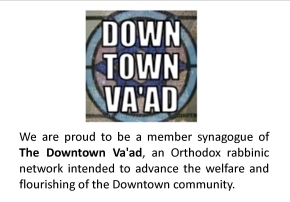 We're a vibrant, warm, and welcoming synagogue in the heart of the Lower East Side. The Stanton Street Shul is an intimate Modern Orthodox congregation. Located at 180 Stanton St. in the historic Lower East Side, we serve the diverse population of Lower Manhattan and beyond. Stanton is home to a vibrant and growing community. Under the leadership of Rabbi Aviad and Lindsey Bodner, People of all ages, backgrounds and levels of observance gather for weekly Shabbat services and lively kiddushim, life-cycle events, beginner and advanced level classes, kids programming, women’s services, young professional events, guest lectures, holiday and garden parties, community dinners, chesed activities, cultural events, tours and more. We celebrate diversity while focusing on what we share in common, welcoming all who seek a place of Jewish prayer and community, guided by our motto, “All are welcome, all will feel welcome.” Click here to read our full mission statement, and core principles. Join us, or come visit; We'd love to meet you. Click on the large picture to see the next one in the gallery.